Meet Marc Keshishian, MD. He's a DINO - a Doctor in Name Only - who is the Medical Director of Blue Cross, Blue Sheild, Michigan. Marc (aka "Dr. Keshishian") believes in the ABMS Maintenance of Certification (MOC). At least in principle. You see, Marc does not participate in MOC himself. 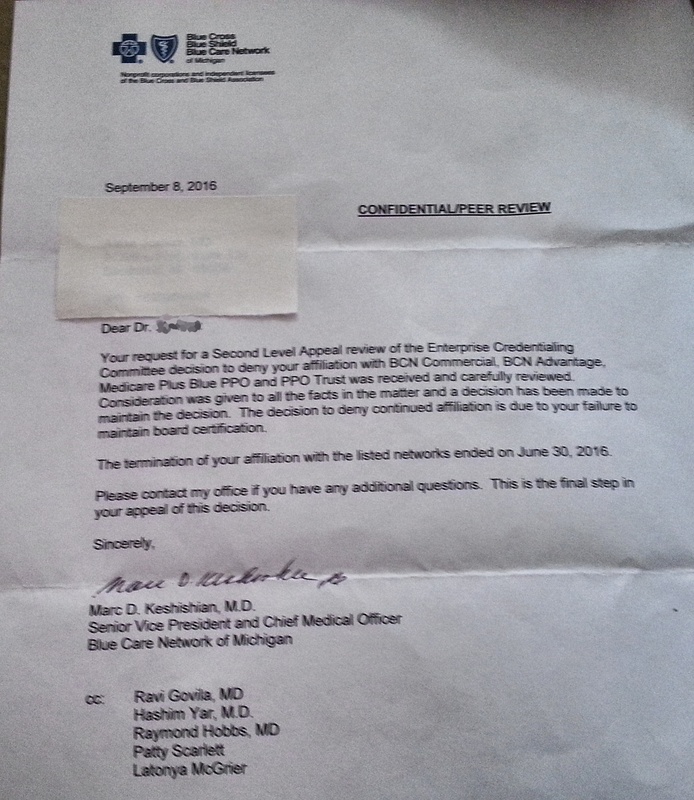 Instead, after a two-step "careful review," he just decides that those who do not participate in MOC are not worthy of his blessing to participate as a BCBS-Michigan provider, even if they have 10 years experience and are a minority physician provider. Michigan patients should be furious. After all, these corporate DINOs are limiting patient access to physicians because credible physicians who refuse to participate in the unproven, costly, and corrupt ABMS MOC re-certification process. Because MOC has been documented to be more interested in its political and financial agenda than patient care, the AMA House of Delegates resolved to immediately end MOC. 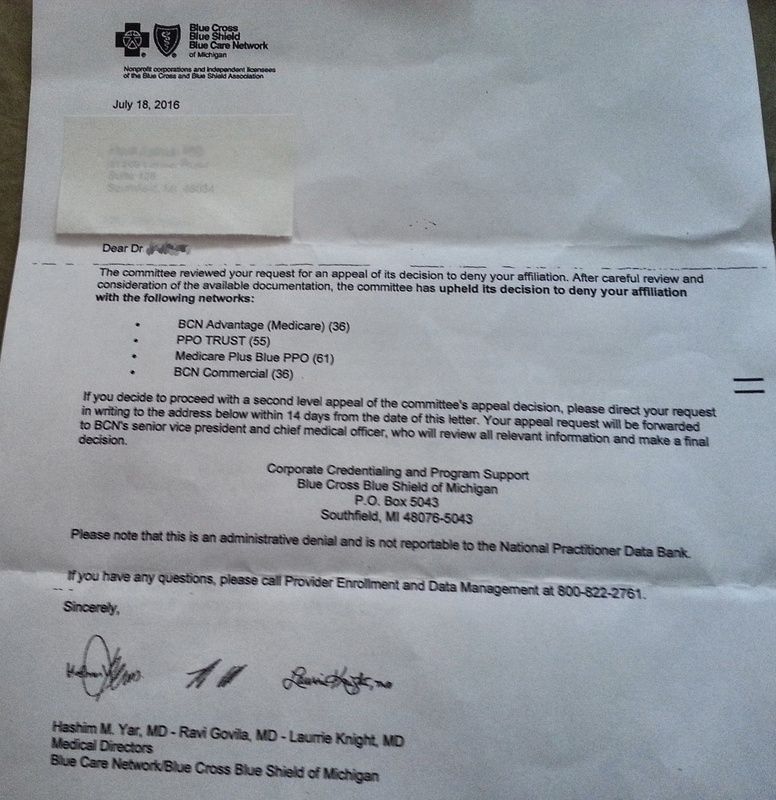 It is clear that corporate DINOs at Blue Cross Blue Shield Michigan don't care. As we can now clearly see, MOC helps preserve the DINOs income and the company's bottom line by restricting access to hard-working (yet expensive) patient-care physicians. PS: Remember, while it is unsaid in his letter, there may be other conflicted DINOs responsible for Blue Cross Blue Shield's policy of requiring MOC for insurance panel participation. This is terrible. We live in rural America and we can't find any internists or family practice docs (forget finding a specialist) to come here to replace the ones who retire or go into some other profession. Physicians are fed up with MOC, bureaucracy and Obama Care. They are upset about the broken system where insurers exclude physicians from practice and medications from the formulary. So many other restraining bureaucratic problems to talk about here. I have to give money to my mother and father every month for what Medicare and supplemental insurance won't pick up like insulin and accurate glucose monitoring supplies. What gives with the high cost of insulin that exhausts coverage quickly and then many patients are in the donut hole without a way to pay for the rest of the year? It is ridiculous when you pay in all your life and do not get proper coverage that was promised and you see the multi-million dollar compensation packages of these insurance executives. And the ABMS execs are getting up to a million dollars and beyond. Patients in the country only have Nurse Practitioners and Physicians Assistants to see and I can't mention all the complications and unintended consequences in a public forum. They are confused about what to do with patients. It is tragic and the bb's are piling up. Obama Care was designed to fail. It was designed to ration out medicine. Insurers leave the state exchanges due to costs and fraud that has been linked to perhaps billions of federal dollars squandered. Was Obama Care designed to fail just like ABMS certification and MOC are designed to fail docs? There are no real practicing docs at the ABIM or any of the ABMS medical boards. Is it surprising that the insurers leadership is comprised of a few DINO's for window dressing and the rest are Wall Street bankers like ABIM's chief medical officer Doctor "PricewaterhouseCoopers" Battaglia, or CMS/NQF cronies like Doctor Rich "DINO" Baron who are all invariably politically and financially conflicted in one way or another. How about Doctor Lois "DINO" Nora who ignores the important questions from physician reporters and refuses to fix the problems by ending their immoral use of physicians as cash cows for MOC and ABMS Solutions revenue streams! And look at how our presidential candidates are locked into well-timed media wars and publicly exposed blackmail schemes! I'm going with the one who says they will end Obama Care and cut the strangulating regulatory bureaucracy. Check out Charles P. Kroll's Tweets: "graft in graph" and Dr. Bardack, Hillary Clinton's Faustian deal with her physician. A DINO is judging a clinician who did not participate in ABIM but who in CME compliant, competent in every other aspect and is originally BC? Sounds like a lawsuit and triple damages to me. The Mayo Clinic has just published a survey which seems to strongly conflict with the picture Baron paints regarding what he has been "hearing" from physicians. Worth reading. Care to counter with some REAL peer reviewed research Dr. Baron? Hmmmm, I predict utter silence. Until these are recognized, and adequately addressed, there will be continued "dissatisfaction" with MOC and the burden on younger physicians could worsen. The ABIM Foundation is an NGO created by partisan professional medical politicians using physician fees to prosecute their ambitious political campaign, known as Choosing Wisely. CW violates physicians' and patients' rights. It is not a medical campaign, but a pseudo-medical social assault, an imprudent experiment to ration healthcare. It uses humans like research subjects in a mass social experiment--conducted even as far away as Japan and the EU. Choosing Wisely was primarily created to be the other side of the coin of the Affordable Care Act, which is totally unaffordable. Choosing Wisely was unleashed on the public to limit access to healthcare through a complex series of misguided "mandates" without being studied properly to understand the unintended consequences. CW is not a "conversation", it is pure political propaganda with McCarthy-era style black-listing as the eventual outcome if you don't conform. Utilizing brand and commercial trade strategies, CW is a high-pressure, highly unscientific and highly improper Consumer Reports sales pitch. With CW Medical science takes a back seat to manipulative dumps of "data-driven" research performed on unwitting subjects who do not know that patients and physicians are the experiment. Part of the ABIM Foundation experiment is too see how far a partisan NGO can go in manipulating the populace. But primarily the experiment is to find the breaking point patient health and with voluntary cost controls, based on untenable newspeak concepts in the form of an ever increasing number of items--a series of abbreviations on a checklist that takes more time than is possible to even get to two or three out of seven of the "SDM" recommendations. All this pedantry invented by policy fanatics greatly cuts into a patient's appointment time and increases stress in the exchange. CW combined with ABMS and the very expensive "pearls" invented out the concept of ABIM Foundation pseudo-professionalism, can be distilled down into one over-riding ABMS concept--profit for professional medical politicians and their crony special interests. While we slowly digest the Orwellian aspects of ABMS/NQF Choosing Wisely newspeak and its affect on the American healthcare system and psyche of patients and physicians, we should consider coming to our senses. Choosing Wisely as an abnormal imposition that is both harmful and lacking in medical science. I'll never understand how a few pages of ABIM Foundation material published on the topic of professionalism in the new millennium could justify ABIM executives to engage in money laundering from 1989-2007, and think that no one would notice. And they profess to be an ethical organization. What utter fools they have made out of physicians who paid for it all. Where is the DOJ to remedy this kind of deceitful practice? "Patients advocate award given to ABIM Foundation for leadership in Choosing Wisely campaign"
Where can I find the best sample anti-MOC letter to send? Nothing is more dangerous than trying to kill someone--and doing it wrong. The Hunted will become the Hunter.